The Gymea Lily is an iconic Sydney wildflower and was a favourite of mine when I roamed around the bushland of Loftus growing up. The tall flower spike with the deep pinkish/red flower spike was a like a beacon and provided a great reference point when exploring. The flower spike is now used by florists and is a dramatic addition to large spectacular arrangements. Now that I live in Northern NSW a common sight is the ‘sister’ to the Gymea Lily – Doryanthes excelsa – it is the Spear Lily – Doryanthes palmeri – which I grow in my garden. 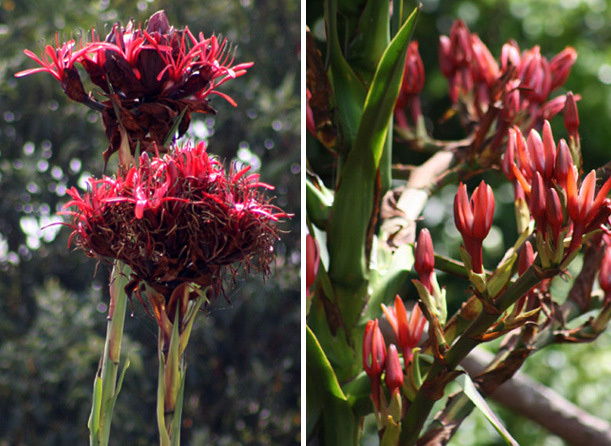 The Gymea Lily is on the left & the Spear Lily on the right. I have used the tall spectacular Gymea Lily flowers spike as the central focus of this work and added wildlfowers from around Australia. Included are – the NSW Waratah, Flannel Flowers & Wax Flowers, the Western Australian emblem – Mangles Kangaroo Paw, Firewood Banksia, Geraldton Wax, the Hybrid Eucalyptus ‘Summer Beauty’ and the Australian Floral Emblem – Golden Wattle – Acacia pycnantha. This design has been in the making since 2009!! I had started it & then got sidetracked with a busy schedule with family and it was something that I had always wanted to complete. I have a number of projects that have been long term like this one which I am slowly working through & finalising alongside plenty of more new ideas! Some of the ‘old but new’ work I will be working through in the next couple of months including some more contemporary work which is lovely to be developing finally! This work will be part of my February exhibition at the Northern Rivers community Gallery in Ballina.